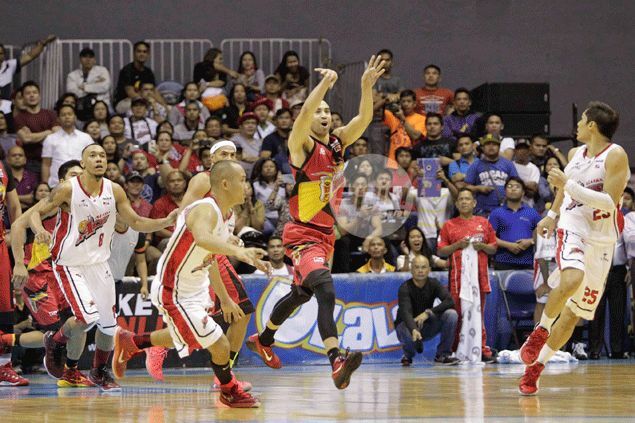 PBA Finals Game 1: Bang! For me, since I started following college basketball, I’ve always wanted to go Phog Allen Fieldhouse at Lawrence, Kansas and watch a Jayhawks game in person. That “Rock Chalk” chant is just mesmerizing. Of course, Lawrence is also where Dr. Naismith started this whole “basketball” thing, so the Phog is certainly a must for me. That was maybe until I recently moved to the Manilla, however. Before I got a taste of the Philippines Basketball Association. n Talk & Text Tropang Texters (which is an awesome name) and San Miguel Beermen (again, Awesome name) before at the Mall Of Asia Arena. The atmosphere at those games itself was awesome already, even if the stands weren’t fully packed. 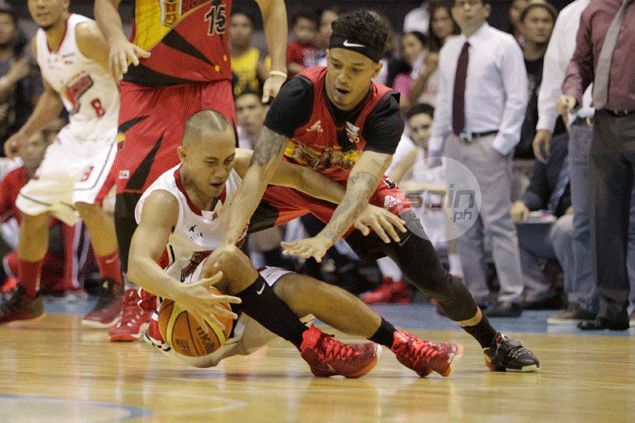 Talk & Text gave all their punches to the Beermen but were eventually swept. Once it gets to the Finals though, it’s a whole different story. I watched Game 1 on replay as I was stuck on the horrific Wednesday traffic of Manila. I reached home for the final 8.8 seconds of the game on TV and it was still one of the most interestingly entertaining games I have witnessed on live television ever. Just watching that brief few seconds, I was really excited and frustrated at how close a game this must have been throughout the first three quarters and that I had wasted 2 hours on a taxi on the traffic without being able to watch this game. So I checked up the box score and was in quite shock when I saw that the Alaska Aces finished the first quarter with 5 points while San Miguel scored 27. As amazing as it was the Aces were down by 22 at the end of the first quarter, it was even more amazing that they fought all the way back into the game even though the San Miguel Beerman has a player like June Mar Fajardo on their team. 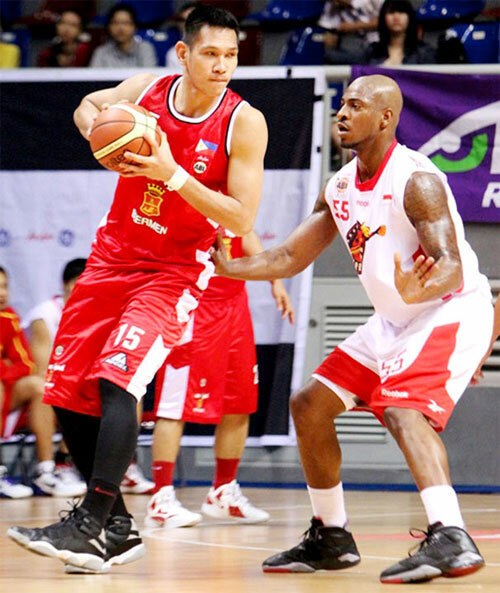 June Mar “The Kraken” Fajardo going against Steven “The Demon” Thomas. I love nicknames. For those who don’t know, June Mar Fajardo is the biggest thing in Philippino Basketball as of this moment, both literally and figuratively. June Mar Fajardo aka “The Kraken” (which is once again an awesome nickname. Do you see a trend here yet?) is a 6’11”, 270 lbs (2.11M and 122 kg, for the majority of Metric system readers) behemoth who has been dominating the PBA for currently his 3rd year being the League MVP in his sophomore year and contending for a consecutive award this season. You might think “Well, yeah. He’s huge. He should be dominating. What’s all the fuss about?”. The thing is that players his size aren’t supposed to run the floor as well as June Mar does. They aren’t supposed to be as good a passer as June Mar is. Very few players have his combination of footwork, hands, and touch around the rim. Take a look at these highlights from this Game 1 of the PBA Finals alone. Did you see how he passed out of the double team with such ease? Did you see him run the trailer break with Chris Ross for the sweet finger roll? Did you see him touch pass the ball perfectly to Chris Lutz on the fast break? For all that finesse, did you see how he commanded 5 Alaska Aces players to cave in to quintuple team him once he got the ball inside? That’s how much of a threat he is. June Mar Fajardo is Marc Gasol if Gasol were much more bigger than his NBA counterparts a la Shaq. Yet here the Beermen were, after leading by 27 points, having to defend a potential game winning shot. But you have to question the Aces themselves how they got themselves level after digging such a deep hole. This guy is the answer. June Mar Fajardo was selected, without hesitation, 1st overall by the San Miguel Beermen (then the Petron Blaze Boosters) in the 2012 PBA draft. The Alaska Aces owned the second overall pick that year and they took Calvin “The Beast” (seriously, nicknames. Start taking notes) Abueva. Since then, even after a rough sophomore slump, Abueva has been the undisputed star for the Aces. Kraken and the Beast might be a good Disney movie title. It is only appropriate that these two would come full circle to collide again in this series. For all the praise Fajardo has received, Abueva came out that rookie race winning the PBA rookie of the Year. This year, Abueva has been phenomenal averaging 15 points and 11 rebounds thus far. Abueva, himself has also pushed himself into contention for the two horse race for Player of the Conference between him and Fajardo. Did you hear the MVP chants? 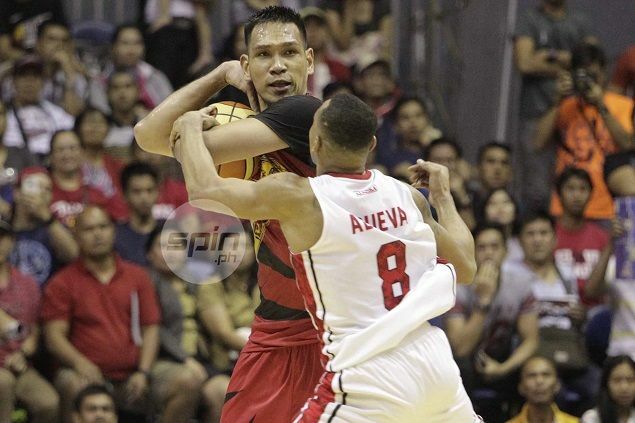 Abueva might only be 6’3″ and 206 lbs (1.90M and 93 kg) be he plays much bigger and tougher than his size. Abueva is a banger inside and he can get rough and rugged going for rebounds and scoring on the offensive boards. As a player of such style, he is bound to draw negativity as well and you can always see him in the game either giving out or receiving blows. In this game he used his 22 points and 10 rebounds to fuel his team to a tied ball game with 8.8 seconds left and possession of the ball. However, it couldn’t have only been one player that brought the Aces back in the game no matter how good he is. Other than having the best name in the PBA as of right now (a title that I might change on a daily basis), Dondon Hontiveros was hitting clutch shot after clutch shot for the Aces prompting this memorable comeback. What I loved the most was the commentators affection for repeatedly and emphatically using the term “BANG” for his made threes. Dondon shot a wild 13 three point shot while making only 4 of them, but those 4 were huge. The last minute of regulation in this game was very interesting. 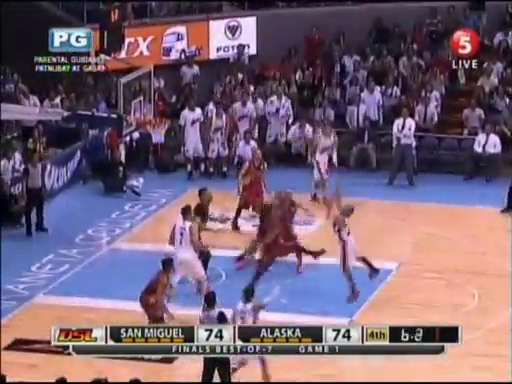 It starts out with Alaska running a great variation of Horns to get Dondon for a wide open mid-range shot to take the lead at 74-73. Interestingly, the commentators didn’t not yell “Bang”. San Miguel then took the ball back up and threw the ball into the post to the post to the reigning and potential back-to-back MVP who scor- wait, that’s not what they did? So down by 1 point with 40.8 seconds left on the clock, the Beermen used up 23.4 seconds to scramble around on the perimeter, penetrating recklessly into Alaska’s set zone defense without giving June Mar Fajardo (who I’d like to mention again, demands at least a double team to contend and is the reigning MVP and is in contention for another MVP trophy) a single touch through out the whole possession. I wasn’t expecting the Beermen to throw the ball in their and watch the Kraken work, but against the packed up zone, a pass to Fajardo would have at lease cause Alaska to collapse a little allowing more room for the more than capable perimeter combo of Arwind Santos, Chris Lutz, Alex Cabagnoy, and Marcio Lassiter to do some damage. The possession ended up with a wild fling at the basket from Lassiter. Abueva grabbed the rebound and called a timeout, so Alaska would be starting possession at mid court with 17.4 second left and a 1 point lead. It should have been easy. Inbound the ball to Jayvee Casio. Casio gets fouled. Casio calmly hits 2 free throws. San Miguel bring up the ball for the last play and still refuse to acknowledge June Mar in the post and waste the possession on an awkward 3 point shot. Alaska wins. That’s how it should have been. But the Gods of Basketball looked down on this game on a bored Wednesday and thought “Screw it, we’re bored. Let’s have some fun.” and made sure a certain patch of hardwood was slippery enough for Jayvee Casio to slip at midcourt causing him to get tangled with Chriss Ross for a jumpball. The gods of basketball are cruel. Chriss Ross would win the jumpball for San Miguel and Fajardo got fouled. Fajardo miss the front end of his two free throws but made the second to tie the game at 74. Alaska got to set up at half court for one last play with 8.8 seconds left and that’s when I turned on the television. The following 8.8 seconds were one of the crazier basketball moments I have watched live. Jayvee Casio receives the inbound without slipping this time and the clock starts ticking. Casio makes a drive towards the basket and stops at the free throw line. He realeases the shot with 6.2 seconds left on the clock. Note that the score is tied. 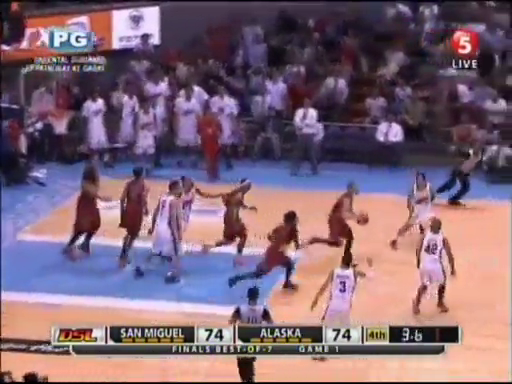 Even if Casio ran the entire clock out, Alaska would still be going into overtime. Instead, Casio releases the shot with plenty of time left. Regardless of missing or making the shot, the Beermen would still have plenty of time to set up for a good look at a shot. Casio misses the shot and Chris Lutz grabs the rebound with 3.6 seconds left on the clock. Hmm. So Lutz sends the shot flying almost immediately after he rebounds the ball for a prayer that airballs and goes out of bounds while still leaving 1.2 seconds on the clock. I was watching this live and I could barely believe it. Was there a clock malfunction on the court? Did someone yell at him to take the shot? Lutz played a great game overall, going for 24 points, 4 rebounds, and 4 steals but this left a huge stain in his reputation. The Aces came out of the huddle to set up a nice attempt for Dondon who got an open look but was unable to “BANG!” the shot in. But at least he made sure there was no more time left on the board. The Alaska Aces made sure that they completed their 22 point comeback in overtime with two huge three pointers from Jayvee Casio and Dondon Hontiveros (BANG! BANG!) as they would go on to win the game 88-82. But we all learned a lesson from this game. Always make sure that you have the last laugh. Note to readers: I am Thai and new to the PBA, so I might have missed/left out/misunderstood some crucial points or overlooked some parts of the Filipino basketball culture. I’d like to apologize in advance for any such mistakes. If you have any suggestions and corrections for me, please do share with me as I am more than willing to understand different cultures of basketball. Recap for Game 2 can be read here. Recap for Game 3 can be read here. Thanks! I’m looking forward to the next conference as well because a player who I have been watching for a while (Chris Charles) has been signed by Blackwater Elite as their import. 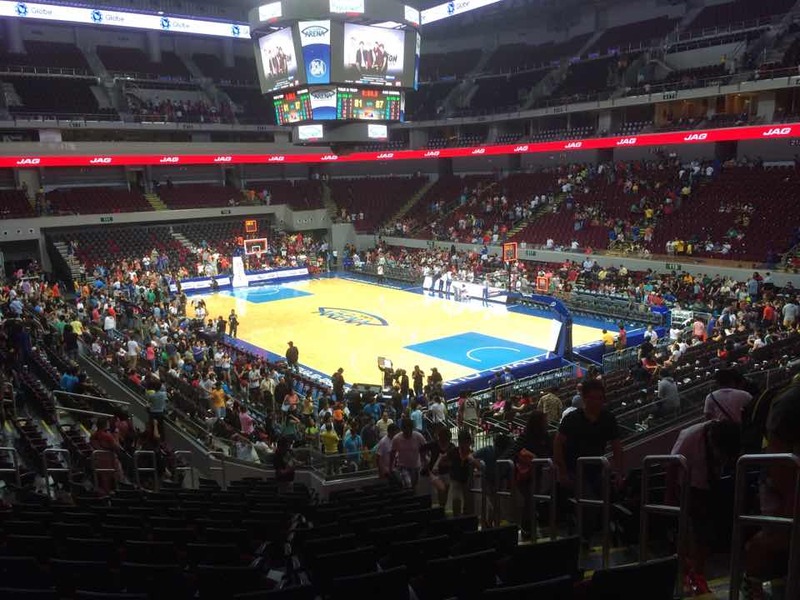 So the teams left are: Global Port, Gin Kings, Meralco Bolts, and Rain Or Shine. If you have any updates, please tell me as well! Rondo เดือด! จะเอาอะไรกับผม ไปชื่นชมลูกพี่ LeBron นู่นดีกว่าไหม? !